Bakelite was invented in the early 1900s by Dr. Leo Baekeland and his team of chemists. Although some pieces in muted colors without carving were made earlier, jewelry cleverly crafted from phenolic plastics became really popular in the 1930s. The term Bakelite is popularly used to describe these pieces, and that's not likely to change. However, many beginners don't know that the colorful jewelry they run across labeled as Bakelite is most likely made of a related substance called Catalin. Learn more on this topic reading: Fun Vintage Stuff Made with Bakelite, or is it Catalin? The most desirable carved bangle bracelets with polka dots and multiple colors laminated together and ultra-cool figural pins, including overdyed or resin washed examples, sell for far more than the average collector might want to spend. Even so, there are still selections available in all price ranges. Plain pieces aren't dirt cheap like they have been in the past, but they won't run anywhere near to several hundred to several thousand dollars per item like the high end stuff. For the beginning collector, looking for plain bangles to wear in colorful stacks can be a good place to start. Bakelite dress clips sold singly or in pairs are also generally more affordable than figural brooches, even when carved. Bakelite clip earrings are also reasonably priced, and they coordinate beautifully with bangles in similar colors. Butterscotch and pea green are the most common and, generally, the least expensive colors although each piece much be evaluated individually for rarity and desirability when determining value. Some collectors focus on marbled pieces (which were sometimes called "end of day" in the past). Marbled Bakelite items incorporate more than one color swirled together, and they are easy to find. End of day pieces have a more globby look according to Bakelite experts who have continued to research this type of plastic. These pieces, which sometimes resemble camouflage fabric and are fairly unattractive in spite of their rareness, were actually made at the end of the day when small leftover batches were mixed together so they wouldn't go to waste. These pieces, which are highly valued by the most ardent Bakelite fans, are sometimes confused with marbled Bakelite due to the shift in terminology over the years. Don't take it too personally if someone corrects you about using incorrect terminology as you are learning. Also keep in mind that It's hard to attribute the maker of most Bakelite jewelry pieces, especially those made during the 1930s and '40s. 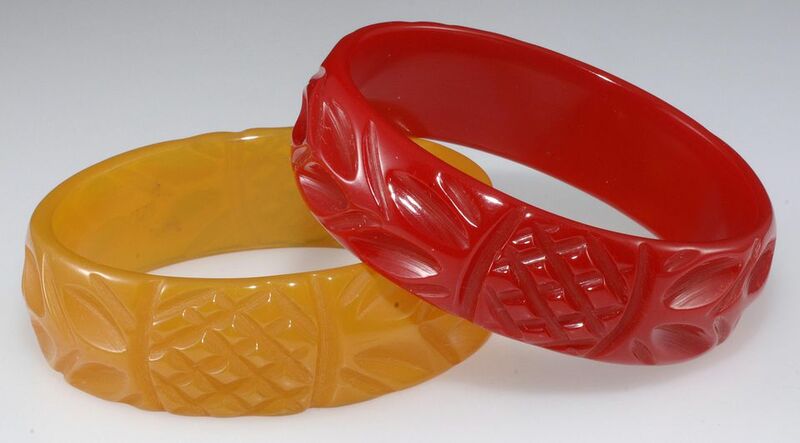 Companies in the United States making this jewelry were U.S.A. Bakelite Co., Marblette, and the Catalin Co., among others. In France, it was used by makers like Flammand and Baverel to fashion jewelry. Some recognizable costume jewelry manufacturers, with The Napier Co. as one example, also used Bakelite (marbled and plain versions) in a few of the company's designs. Another benefit in buying more common pieces comes with their relative exemption from fakes. But, it is important to remember that many new items are actually made from genuine Bakelite stock or old radio cases recycled from the '30s. Those making these pieces set themselves apart from those creating true reproductions as Bakelite artisans. Their work uses old materials, but the carved designs are new. Some of them are already considered collectible in their own right. Using small Bakelite pieces to form larger pins shaped like jointed characters is a common motif for jewelry crafters as well. Making these pieces isn't a problem, it's not marking them accordingly where things get sticky. And when the modern Bakelite artisans do mark them, others sometimes remove the marks to sell them as old pieces as they change hands. Even when they're sold as "marriages" or reworked pieces, these items will unfortunately end up fooling an unsuspecting collector if they aren't permanently marked. Note: Before you think about carving old Bakelite yourself, be aware that cutting this substance produces very dangerous dust that should not be inhaled. Do your research to learn about the best ways to take precautions before attempting to cut or carve old Bakelite. Those crafting new Bakelite out of old pieces find it quite insulting to call their work "reproductions" or "fakes." Others disagree that if carving or dots added to old pieces are not original, then those are indeed forgeries of sorts. Each individual has to decide where they stand on this subject. One thing all plastics fans agree upon, however, is that there are true fakes out there that imitate old pieces. They are made to look like Bakelite, and they have been imported and sold as the genuine article. They aren't made of the same substance as Bakelite, and they don't "test" as such. These problematic items often show up at flea markets and appear in online auctions fairly frequently. Many people have deemed these to be "fakelite." Looking for a chalky appearance in the ridges of carving. This may look like dust, but will not wash away. The absence of the familiar clunking sound two pieces of genuine Bakelite make when tapped together gently. Again, it also does not test as Bakelite, although the carving may imulate expensive designs. To protect yourself while learning to distinguish old from new, be sure you're comfortable with the dealer or individual selling a costly piece. Take some time to ask questions about the origin of the item, and have an expert authenticate it for you if you are still not sure. Also, spend wisely by learning the feel, smell, sound, and look of authentic Bakelite. Read Ways to Test Bakelite for Authenticity to learn six tests you can use to identify this type of plastic. Some of these can even be done while shopping at thrift stores and flea markets. Pamela Y. Wiggins is the author of Warman's Costume Jewelry.